Until Governor Romney selected Glenn Beck's "soulmate," Paul Ryan, as his running mate, there was not going to be any reason why this Review would have to address the campaign for the White House unless Beck talked about it. Of course, he has done that a lot lately. You will not hear Beck talking about Governor Flip-Flop though. ...[Romney]'s advisers will also need to do a wee bit of vetting before they pounce on another Obama “gaffe.” As BuzzFeed’s Andrew Kaczynski reported today, the idea that Washington can’t be changed from the inside was one of Romney’s own campaign themes in 2008. “I don’t think you change Washington from the inside; I think you change it from the outside,” Romney said—repeatedly—during his losing race against John McCain. Now, even though he’s running once again as an outsider—a “non-politician” who’s devoted his life to business—Romney declares he’s going to change Washington “from the inside.” This isn’t a sign of desperation so much as an indicator of incompetence. Incompetence? Desperation? 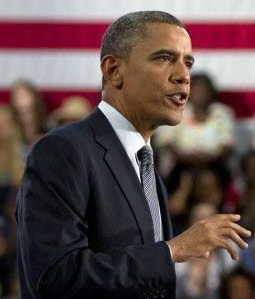 Either way, Romney will say anything to attack Obama in the search for as many white votes as he can obtain. 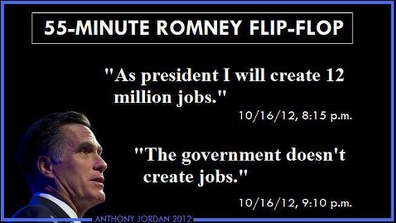 Romney is a big time flip-flopper, a pathological liar, a religious extremist, a plutocrat and a hypocrite. Maybe Beck should declare him as his "soulmate" too. 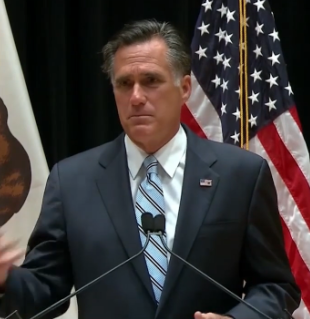 On Friday, Romney released his income taxes for 2011. In order to abide by a statement he had previously made about having paid at least 13% on his taxes in each of the last 10 years, he decided to forego claiming a large amount of deductions he could have taken to reduce his tax bill. Unfortunately for Gov. Flip-flop, less than two months ago told ABC News, "I don't pay more than are legally due and frankly if I had paid more than are legally due I don't think I'd be qualified to become president. I'd think people would want me to follow the law and pay only what the tax code requires." It is almost as if Romney is trying to run away from the White House, that he is trying to lose! She's partisan, yes; but no one can argue that she has her facts wrong about the deceitfulness of Mendacious Mitt's campaign to date. Update, 10/18/2012: This graphic after the second presidential debate was copied from Facebook. Update, 10/25/2012: The following was compiled by pangeajoker on youtube. The musical accompaniment is called "With Friends Like These," and the title of this is "Why Republicans Say You SHOULDN'T Vote for Romney." Is it not obvious that Mitt Romney will say just about anything if he thinks that it will help him win votes? If you are still an undecided voter, see Clinton's DNC speech.